Provide comfort for the family of Norma Shays with a meaningful gesture of sympathy. Norma J. Shays, 77, a resident of Niles School Road in Pownal, Vermont died peacefully Tuesday March 26, 2019 at her residence surrounded by her family. She was born in Albion, Michigan August 1, 1941. She was the daughter of Charles Betit and the late Betty (Miller) Betit. Norma received her education in Michigan. She married Harold Joseph “Joe” Shays on October 18, 1958 in Pittstown, NY. Mr. Shays died November 22, 1998. In earlier years Norma owned and operated TJ’s Tanning Salon in both Pownal and Bennington. She was a member of the American Legion Post 90 Auxiliary and the Disabled American Veterans. Her family and grandchildren were her main interest. Survivors include her children Cory L. and Mai-Ly Shays of Shaftsbury, VT and Anna Marie and Roger Livingston of Bennington, VT; Twelve grandchildren, 19 great grandchildren. Her step father Charles Betit of Ohio. Two sisters, Mary Rayburn and Jody Kline both of Ohio and four brothers, Charles Clayborn of Bennington, VT, Charles Betit II of Michigan, Ronald Betit of Ohio and Bill Betit of North Carolina. Along with many nieces, nephews and cousins. She was pre-deceased by her husband Harold Joseph Shays and two sons, Timothy and Scott Shays. Friends may call at the Mahar and Son Funeral Home on Friday March 29 from 5 to 7:00 p.m.
A graveside service will be held at the family lot at Oak Hill Cemetery in Pownal, VT on Saturday March 30, 2019 at noon with Chaplain Kenneth Coonradt of the Vermont Veterans Home officiating. If friends desire contributions in Norma’s memory may be made to the Vermont Veterans Home Activities Fund through the office of the Mahar and Son Funeral Home 628 Main St. Bennington, VT 05201. 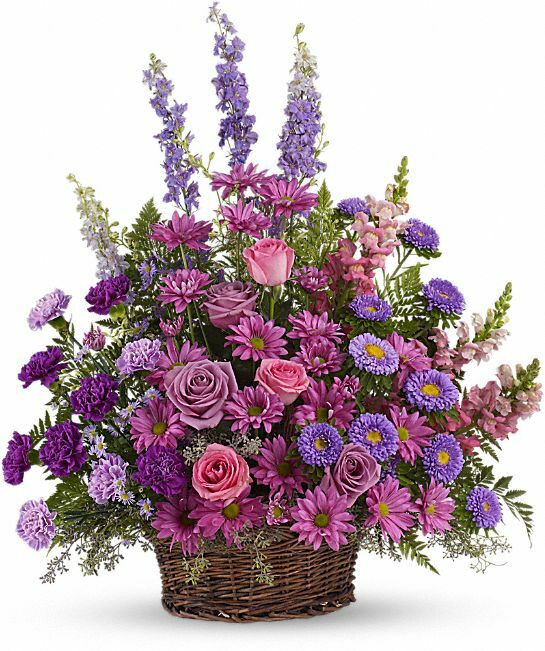 To send flowers in memory of Norma J. Shays (Clayborn), please visit our Heartfelt Sympathies Store. Audrey Lynn and Corey Michael, Ron, Diane, Brooke and Brett Betit, and others have sent flowers to the family of Norma J. Shays (Clayborn). Audrey Lynn and Corey Michael purchased the Gracious Lavender Basket for the family of Norma Shays. I had the best neighbor any one could ever ask for. Loved the visits with Mimi and Pop and there family. When my girls would disappear I knew right where they were. Hanging with Mimi and Pop. You will be missed but I know you are reunited with Pop,Scott and Tim. RIP my friend and thoughts and prayers sent to your loved ones left behind. Celebrating your life. Praying for peace, comfort and love to surround all family and friends. Rest in peace. Ron, Diane, Brooke and Brett Betit purchased the The FTD Truly Loved Basket for the family of Norma Shays.